I can never throw out any fabric. Even the tiniest scraps get recycled into something. I give alot of my scraps to my BFF Beth to use in the creation of her fabulous one of a kind pin cushions. I’ve started using my scraps to make craft aprons. It is a good way to use up the smaller pieces of vintage fabric. Today I whipped up a craft apron for a fellow blogger and artist extraordinaire. 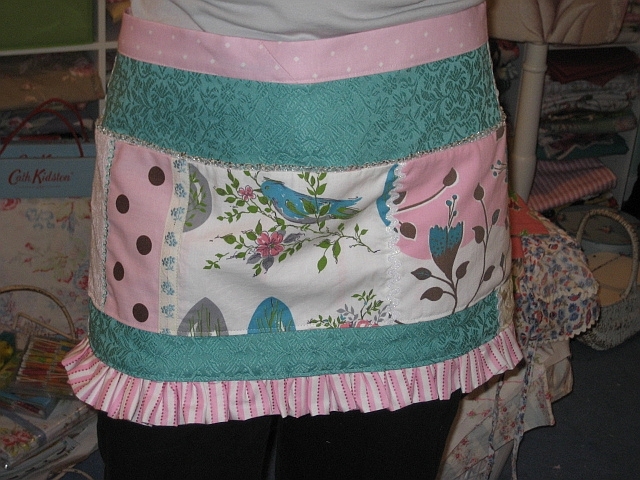 I used lots of scraps in turquoise, pink, chocolate with bits of trim and beads to make it sparkle. 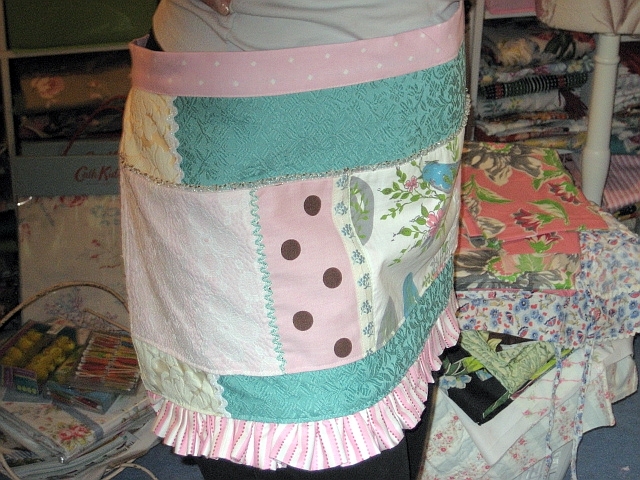 I’m going to be launching an etsy shop soon and I plan to put my scrap aprons in that shop. Now I better get busy and produce some more scraps and package this little pretty off to NJ. OMG!!!! It is totally fabulous! She will love it! Oh Suzy, that apron is wonderful! I love the fabric combination you’ve put together. I KNOW she’ll adore it. And your new header looks great. Is that a lace cap hydrangea? Its beautiful with its varigated leaf. love this apron !! so awesome !! glad to be your swapping bits buddy -i just love your blog !!!!! I love something pretty AND useful. 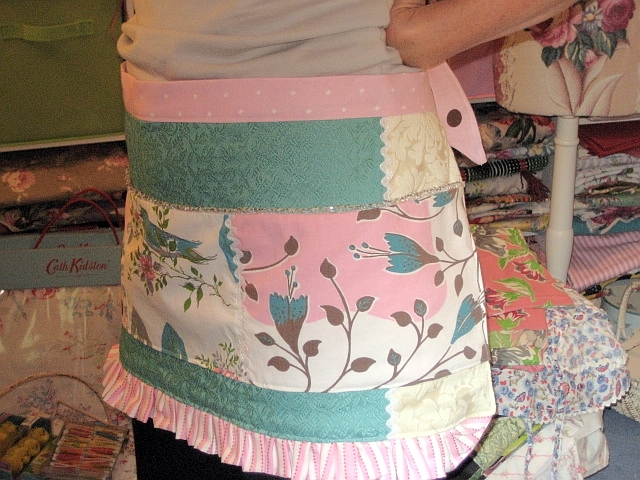 My craft room is upstairs but I prefer to put stuff together downstairs…this apron would eliminate some of my running up and down the stairs (maybe? )..can’t wait for your etsy shop!